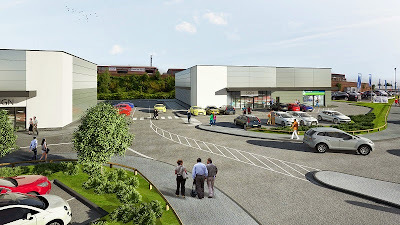 Gregory Projects Limited has submitted a planning application to progress phase two of its Rotherham retail development at Parkgate with charity Barnardo's and Formula One Autocentres the latest potential occupiers to show an interest. The land owner, Rotherham recycling experts, Ron Hull, teamed up with Leeds-based developers, Gregory Projects to bring forward a potential retail development on the site of a former car showroom at Great Eastern Way. With funding from Bramall Properties Ltd, construction of the fully let 40,000 sq ft phase one is well underway with completion expected by July 2015. Aldi, Iceland and Home Bargains are all committed. The plans for phase two, via Colliers International, are a change to the outline plans and would enable half of the 10,000 sq ft of space to be used as an auto centre rather than for retail. Incorporating workshop bays for carrying out vehicle repair and services, the centre is expected to attract "additional employment opportunities and indeed a range of jobs different from those on the rest of the retail development." Richard Tovey, director at Gregory Projects (which is part of the Gregory Property Group) said: "We are pleased to progress to a planning application for phase two on the strength of an exceptional record of lettings for phase one. We have brought much needed discount retailers back to the area for the benefit of the Parkgate community." Slight amendments are also being proposed that would enable one of the smaller, 1,250 sq ft units on Phase One to be taken by the children's charity, Barnardo's. The Leeds office of GVA has advised Gregory on the pre-lettings and is marketing the remaining accommodation. Sheffield-based JF Finnegan is the main contractor with the development is due to be completed by July 2015 at which stage units will be handed over for occupier fit out.